Q: What type of Fire Extinguisher do I need? The first step to take is to check the Fire Extinguisher hazard chart and determine the fire risks your business may have. After this you can go to product selection to select the appropriate size and type of extinguisher for your needs. Depending on your business you may need more than one type of Fire Extinguisher in different zones. If you feel uncertain please contact us prior to placing your order. Q: How often do I have to have my fire extinguishers inspected? All Fire Extinguishers in commercial premises (warehouses, offices, retail stores, factories etc.) and public buildings (hospitals, schools, movie theatres etc.) as well as multi-occupancy residential buildings must be inspected every 6 months in accordance with Australian Standard 1851. 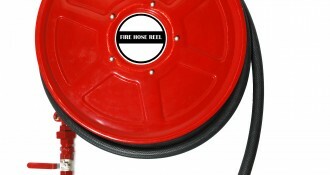 This includes Fire Extinguishers, Fire Hose Reels, and Fire Blankets etc. Q: How many Fire Extinguishers do I need? The first step is to do a risk assessment to work out what type of fires may potentially occur in your workplace. Placement of Fire Extinguishers is governed by Australian Standard 2444 and the Building Code of Australia. As a guide the requirement is one extinguisher every 15 metres if practicable for Class A fires and every 20 metres for Class E and F fires. Obviously a common sense approach is advised in Fire Extinguisher quantities and locations due to the vast number of building configurations possible. This information should be considered as a general guide, not as an exact rule. Q: Who can inspect and test Fire Extinguishers? Unfortunately there are no requirements in South Australia regarding service contractors having to be licensed or accredited; in fact Queensland is the only state with these requirements. This has led to a number of unscrupulous contractors operating in this state without qualification or insurance. To ensure you use only accredited and insured technicians contact the Fire Protection Association Australia via their website www.fpaa.com.au. Q: Is it correct that Fire Extinguishers have to be pressure tested every 5 years? Yes that is correct. Australian Standard 1851 requires that all fire extinguishers be emptied and pressure tested every 5 years. They are emptied and then undergo an internal inspection for any faults. If they pass this test they are filled with water and pressure tested for leaks. If the Fire Extinguisher is deemed functional and safe, it is reassembled, refilled and stamped with a test date. Q: There seems to be some powder at the end of the hose, what has happened? It appears as though someone has discharged the extinguisher either accidentally or otherwise and simply put it back without informing anyone. This is a dangerous practice as the extinguisher is now only partially full. This means it will not perform to its full capacity should a situation arise. All extinguishers must be refilled and re gassed after any discharge large or small. Q: I used my Fire Blanket on a small kitchen fire, is it ok to keep it? No, throw it away and buy a new one. Fire Blankets can not perform well after even a single use. Q: Do your Fire Extinguishers have a warranty? Yes, they have a 12 month warranty against defects. A defect in one of our high quality fire extinguishers is very rare, but all our products are backed by leading importers in Australia. Defects arising from abuse of the fire extinguisher however, are not guaranteed. Q: I have a Fire Extinguisher that has missed a few years on the service tag, can you just fill in the gaps? No, unfortunately we have to start the process again. The Fire Extinguisher in question has to be emptied and pressure tested or replaced. Firechief is a strict follower of Australian Standards. Q: I have a yellow Fire Extinguisher, can you test it? No, Yellow Halon Fire Extinguishers are banned and only used in aircrafts. In Australia serious penalties apply for unauthorised disposal of these types of fire extinguisher because they are filled with ozone depleting gas. Only licensed operators can handle these Fire Extinguishers so you will need to contact the MFS for disposal. Q: Do I have to provide Fire Extinguishers in company vehicles? No , unless the company vehicle is used to carry dangerous goods e.g. petrol, oil etc. The employer has a “duty of care” to do a risk assessment of their entire premises (including vehicles) and act accordingly. Remember that the Australian Standard AS2444 states that any Fire Extinguisher fitted to a vehicle must have a flexible hose. Unfortunately many businesses simply fit their trucks with a 1kg ABE extinguisher on board, however these are totally inadequate for a vehicle of that size. From Gawler to Sellicks Beach and out to Mt Barker. Small jobs will incur a higher service/delivery charge. Q: Do you have service contracts? No, we do not make our customers sign service contracts as we believe in our ability to retain customers without.